Just in case you didn’t know, the rumors are deafening that apple will be demoing/unveiling the new final cut at the LA FCP supermeet. That will be happening tonight (april 12) at 7pm pacific. In case you can’t make it and want to try to get a live stream of the happenings, then we’ve got a man on the inside. Follow @fcpsupermeet as he tries to get enough of a signal to get the word out. 7pm pacific, be there or else… you will have to read up on it tomorrow morning. I just got back from one of the most interesting shoots I have ever been on. Our client wanted multiple short pieces shot, edited, and uploaded daily with a 12 hour turnaround. To make things more complicated we would be traveling 6-12 hours per day and every day we would wake up in a new city! Also, as we got more comfortable with the turnaround we would ramp up our shoot schedule from from 2 edits per day to 4. I thought that this was interesting enough that I would do a quick rundown of our workflow. 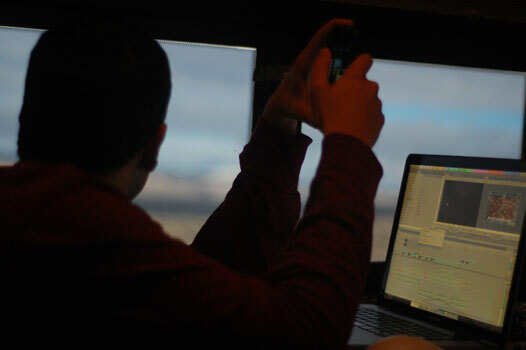 We had two editors running 17 inch macbook pros in the back of the bus. Oh yeah, we had a bus too. A full-on rock band tour bus with bunk beds for 12, a kitchen nook, rear lounge area and xbox and ps2. The editors claimed the rear lounge and set up shop. Each shoot consisted of two hvx-200s and anywhere from one to four flip cams and/or a goPro. Immediately after the shoot we would ingest the p2 cards to the laptop drives and transfer the goPro/flip footage. All the consumer video was converted to prores, and then everything was transferred to a backup drive for safekeeping. Once an edit was completed, all of the assets would be backed up to a separate external drive. It was a huge concern to be editing on a constantly vibrating bus and to have to wipe p2 cards and memory sticks once or twice a day. Data loss was always in the back of my mind, but I think our backup strategy mitigated it as best as possible. 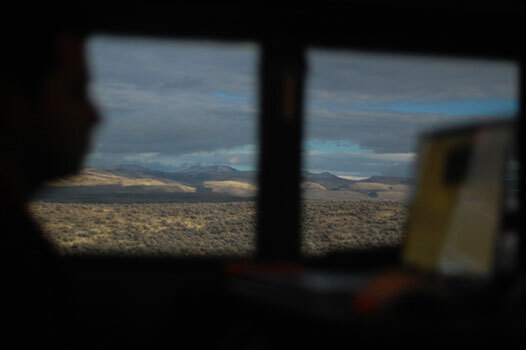 We had both creatives and legal on the bus, so there was very little waiting for feedback. I would cut a rough, show them, and then start making changes. There were two samsung flatscreens in the back and we used them as client monitors. Since the road noise was pretty severe we used headphones for audio playback. Thankfully all parties involved had been at the shoot, so everyone was roughly on the same page as to how things went down and what footage we had captured. In the next few bumpy hours I would churn out the remaining changes, add titles, music and legal. Eventually we would have an edit that was “bus approved” and we would upload it to our proofing server via a myfi 3g to wifi bridge. From there we would check in with the client to get approval and then upload to the live server. It really was weird to be humming along in the Idaho hills and have a strong wifi signal! This project ended up being really cool for much the same reasons that 24 hour film fests are cool; There is a deadline regardless of if you want it or not. The work must get done so that new work can be done. There is a certain reassuring feeling knowing that no matter how hard something is, it will be finished or killed in the next 24 hours. I learned a ton about how to cut faster on the trip, and it was a really refreshing change from sitting in my office all day long. I also gained a ton of respect for cast and crew of live shows. Near time is tough enough, let alone live! Occasionally I will find myself wanting to burn a dvd from a video_ts folder. That is seemingly an easy thing, but if you simply burn the folder onto a data dvd, then you end up with a disc that will sometimes play on a computer, but never on a standalone dvd player. That is the result of the disc formatting. A DVD needs to have UDF formatting, while a data dvd will end up with (probably) HFS+. The easiest thing to do is to use toast or popcorn from roxio to burn them to disc. Either one will format the disc properly and let you get on with your business. The only problem is that I don’t have either of those on my editing station. It turns out you can do it via DVD Studio Pro! Here’s How. •November 30, 2010 • Comments Off on Compressor repair to the rescue! I have thankfully not needed to ever use compressor repair before. It has always lived in the back of my mind as one of those backup plans, like triple-a, or life insurance. At work my tower somehow really tweaked itself and compressor was the hardest hit. This was the first sign that something was amiss. I got this immediately after logging in. From there it got worse. FCP wouldn’t open up, qmaster wouldn’t/couldn’t start, and compressor wouldn’t let me submit any jobs. I was stopped dead. Multiple restarts, zapping the pram, and repairing permissions (remember doing that back in the day?) ended up fixing Final Cut, but not Qmaster. After I.T. frustratedly left I decided it was time for my ace in the hole. I downloaded Compressor repair from digital rebellion and gave it a shot. Click here for the fix! I spend a lot of words here showing how to automate things so that editors can “set it and forget it”. The reason for that is that there is nothing worse than having to wait around for an hour watching your computer work. Well, there sometimes isn’t any way to automate the “next step”, but this will enable you to hit render, go home and then do the rest from home! Here’s how. The best thing about this whole operation is that you probably don’t need any new software! We will be using a protocol called VNC in order to connect our two mac computers. If you have a pc at home, you can still do this, in fact, you can even do it via your iphone! Vnc stands for Virtual Network Computing. You need to run a server app on your desktop machine and a client app on your home machine. 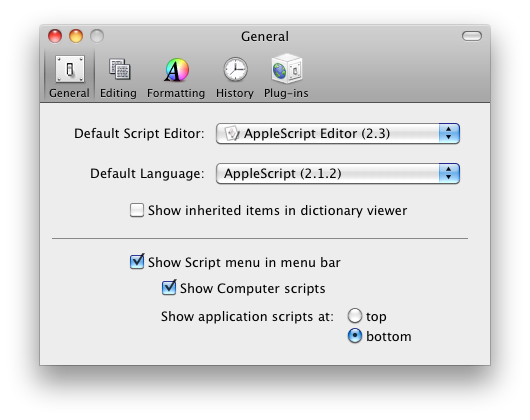 I believe Mac OS 10.4 and higher include a vnc server by default. Here is a quick guide to setting that up. On your home computer side, all you need is to do is: in finder hit command k. Now type “vnc://” then type your work computer’s address and hit connect. The finder will ask you for your password, and then you are in! A good thing to know when you are setting this up is that you can connect “remotely” from the same room, just make sure that you aren’t using an internal ip address. Once configured, you can log in remotely to your desktop and check on renders, start compressions, or upload files to FTP. There are limitations on this tech, though. Due to lag and bandwidth issues, you probably won’t be able to view video playback and editing would be an incredibly frustrating affair. Audio also is not transmitted, so forget about sync audio. Click here for more smoking hot VNC action!